I love romantic Christmas novellas, as they bring all the magic and excitement of Christmas to life with plenty of heartwarming passion. This is a really sweet and amusingly original story. 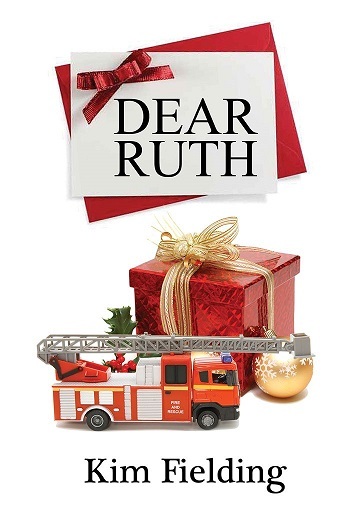 Bryce is wonderful with his constant reminders about the hazards of fire, and he certainly seems to be the perfect person to fill his mum's place as Dear Ruth. That it helps him get closer to his new neighbour, Noah, is a bonus. The revelations about what Harper had been asking his firefighter colleagues was very cute. Perfect way to start the run up to Christmas. KIM FIELDING is very pleased every time someone calls her eclectic. Her books have won Rainbow Awards and span a variety of genres. She has migrated back and forth across the western two-thirds of the United States and currently lives in California, where she long ago ran out of bookshelf space. She’s a university professor who dreams of being able to travel and write full-time. She also dreams of having two perfectly behaved children, a husband who isn’t obsessed with football, and a house that cleans itself. Some dreams are more easily obtained than others. Reviewers on the Wicked Reads Review Team were provided a free copy of Stocking Stuffers: Dear Ruth by Kim Fielding to read and review.